All our tours are bespoke as every group is has different requirements; we take the time to discuss your budget and expectations to provide a programme that works for you. Contact us for a friendly discussion and a guideline proposal. The Kingdom of Bahrain is an island group located off the central southern shores of the Arabian Gulf between Saudi Arabia's east coast and the Qatar peninsula. In 2004 it became the first Middle Eastern country to host a Formula One Grand Prix, and as expected, no expense was spared; the facilities are unrivalled at this purpose built motor racing track. However in our opinion nothing can rival the glitz, glamour and excitement of Dubai which is just 250 miles from Bahrain and reached by air in just 1 hour and is our proposed base for your F1 weekend. Dubai is commonly referred to as a visitor's haven with some of the world's best beaches, most beautiful hotels, and most importantly, endless things to do. From the timeless tranquillity of the desert to the lively bustle of the souk, Dubai offers a kaleidoscope of attractions for visitors. The emirate embraces a wide variety of scenery in a very small area. In a single day, the tourist can experience everything from rugged mountains and awe- inspiring sand dunes to sandy beaches and lush green parks, from dusty villages to luxurious residential districts and from ancient houses with wind towers to ultra- modern shopping malls. Why visit ? Enjoy the glitz and glamour of a luxurious 5 star resort and experience one of the most modern and impressive Grand Prix circuits on the calendar. Enhance your programme with a whole host of activities from Skiing (yes in Dubai!) to Dune bashing. Shanghai is China 's largest city and is well known as the " Paris of the East". A perfect example of the meeting of two worlds, where hyper modern blends with tradition. Stand on the famous 'Bund' gazing across the Yangtze and you can't fail to be impressed by huge Manhattan like glass-coated skyscrapers, that sit comfortably amongst the Starbucks and Haagen Dazs parlours, providing an almost sci-fi like back drop. Behind you the old shanty towns, bustling markets and traditional tea houses nestle amongst the shopping arcades and modern hotels. 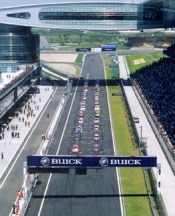 Just 20 miles out of the city the Shanghai Grand Prix circuit is one of the most modern state of the art tracks on the F1 Calendar, purposely designed to provide the drivers with that crucial ingredient - overtaking opportunities. Why visit? Fabulous shopping from glitzty designer stores to street markets selling array of "genuine" copies. Superb modern circuit with inexpensive grandstand and plenty of overtaking opportunities. To make your stay more enjoyable we provide bi lingual Tour assistance throughout the itinerary. Montreal is unique with its wonderful blend of North American dynamism and European atmosphere offering its guest an endless list of sights and attractions. The old quarter in particular is a must see for visitors, with great entertainment, wonderful restaurants and tremendous shopping. It's easy to combine racing with shopping and sightseeing, with such a great destination on your doorstep. The Canadian GP is also very popular with the teams, as they enjoy the fantastic hospitality on offer in Montreal. Besides the joys of the town, the circuit and facilities offer their own challenges, whilst the crowd is generally appreciative of the teams and their efforts. The Gilles Villeneuve Circuit is located on Ile Notre Dame in the centre of the St. Lawrence River, not far from the busy streets of Montreal. The layout is considered to be one that is tough on brakes, featuring long straights capped on each end by a hairpin turn. The circuit has many runoff areas that are extremely narrow, a point of concern for the drivers and with the circuit having little use it tends to start very green, which makes tyre selection a little tricky. Always an incident packed race! Why Visit ? A fabulous city with so much to do and see. Your weekend will be so much more than just a motor race ! Always an incident packed race due the challenges of the circuit and limited run off areas. Ideal as part of an extended Canadian/American holiday ? Our travel advisors will be please to help with your personalised itinerary. What a venue! What entertainment! F1 in the very heart of downtown Singapore. The event has already confirmed its place in the history books as the first F1 race to be held at night. Nearly 1,500 lighting projectors are used to illuminate the entire track of the night race keeping the track almost four times brighter than a typical stadium - all to the satisfaction of every F1 driver. The 5.067km track is a slow, high downforce track featuring tight corners and a bumpy surface, which includes manhole covers and all the other wonders of racing on public roads. Both cooling system and brakes of each car will be heavily tested, as will the driver's ability to race at night. Located at Marina Bay, the circuit is just minutes from exclusive 5-star hotels, a vibrant food and entertainment scene, a fast and efficient underground transit system and the Central Business District. A visit to Singapore is not only about a fabulous F1 experience - it is also a visit to fulfil the senses and invigorate the soul - possibly akin to an Asian New York! The sun may dim but the fun doesn't! As night falls, life begins in many quarters of Singapore. Whether you're a party animal, a 24-hour foodie or just a night owl craving adventure around the clock, there are many sizzling surprises to keep your senses satiated till the small hours of the morning. In fact, Singapore has the added advantage of being one of the safest countries in the world for you to hit the streets at night. You don't have to be a hard-partying hedonist to appreciate the colourful and exciting nightlife in Singapore. Sleep will never be further from your mind as you check out the ultra-chic bars, classy jazz lounges, or move to the groove at hip dance clubs. In line with efforts to improve the nightlife experience for all, there are smoking restrictions on entertainment outlets. Smoking is no longer allowed in all pubs, discos, karaoke bars and nightspots, unless within approved smoking rooms or smoking corners. Even shoppers have no respite! Singapore is one of the few countries where late night shopping is not an exception. And if you're bitten by the shopping bug in the wee hours of the morning, there's always Mustafa Centre ? Singapore's only 24-hour shopping mall. Why visit? Experience the worlds only night run F1 Grand Prix. One of the World's most dynamic and exciting cities. Easy to reach from many international airports. An all American spectacle, the USA F1 Grand Prix is an exciting show both on and off track. Austin, Texas has earned a reputation as one of the 'it' cities in the United States helped by its perfect year round temperature and being renowned as one of the most beautiful and entertaining cities in the States. Downtown on Sixth Street is the place to be - amongst the entertainment & nightlife. It is relatively easy to fly into Austin with many of the major carriers via the US's major hub airports and some direct flights from London Heathrow. vintage shops and boutiques. Austin is home to the Texas Longhorns so you may be able to take in a game. As motor sport is a huge part of the sporting culture of the Middle East, Abu Dhabi is delighted to have secured the right and privilege to host a Formula One Grand Prix on behalf of all of the United Arab Emirates. The Grand Prix franchise has been awarded to Abu Dhabi for a renewable seven year term; the demand for Abu Dhabi from with the region has been phenomenal. The circuit is built on "Yas Island", a natural 2,550 hectare island located to the east of Abu Dhabi island. The state of the art facilities provides close, competitive racing played out on twenty corners that twist through the natural island, passing the marina and winding its way through sand dunes, with several long straights and tight corners. Whilst we can offer hotels in both Abu Dhabi or Dubai however our recommended base for the weekend is a superb 5 Star beach resort hotel just 45 minutes transfer to Yas Island. This idyllic location will be free from the likely traffic congestion and will provide a range of activities and leisure pursuits to enhance your stay ? this includes a Championship golf course, horse riding along the white sandy beach, 4x4 dune bashing. The hotel even has its own sea plane! Then there's the added bonus of being only 15 minutes from one of the area's largest shopping malls. The resort is equal distance from 2 international airports, Abu Dhabi and Dubai International. hy visit ? With a region known for its opulence and extravagance and The Abu Dhabi GP will be the most spectacular and impressive events on the calendar. This region of the UAE is commonly referred to as a visitor's haven with some of the world's best beaches, most beautiful hotels, and most importantly, endless things to do - from Golf to Skiing! A shoppers paradise with some of the worlds largest and ultra-modern shopping malls within a short drive of your hotel. © On Site Events 2018. All image rights and trademarks remain the property of their respective owners and are reproduced with their kind permission.